^ "Judy Collins – Chart history". Billboard. Retrieved 2015-07-30. ^ "Bio Synopsis". Biograsphy.com. Retrieved 2015-07-31. ^ "Judy Collins". Billboard. Retrieved 2013-03-16. ^ "Amy Speace on Mountain Stage". NPR Music. August 12, 2010. Retrieved 2010-09-26. Judy Collins, who chose Speace as the first artist on her Wildflower label, has been singing her song "The Weight of the World" at prominent venues of late, including the 50th anniversary of the Newport Folk Festival and the Isle of Wight. ^ "Independent Music Awards". Independent Music Awards. September 23, 2010. Retrieved 2010-10-13. ^ "Top40-Charts.com". Top40-Charts.com. Retrieved 2010-10-13. ^ Brozan, Nadine (July 9, 1996). "Chronicle". The New York Times. Retrieved 2008-08-01. Roos, John (January 26, 1996). "Taking a Novel Approach; A Grieving Judy Collins Finds Writing a Book Helps the Healing Process". Los Angeles Times. p. 30. Retrieved 2008-08-01. ^ Interview by Wendy Schuman (February 17, 2011). "Judy Collins tells Beliefnet how she used meditation and prayer to cope with illness and her son's suicide". Beliefnet.com. Retrieved 2012-10-16. 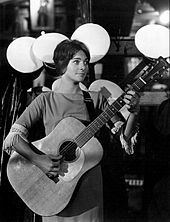 ^ "Biography for Judy Collins". Internet Movie Database. Retrieved 2009-02-24.